What to do for a day dedicated to cheesy corn snacks? How about a drag race and some pyrotechnics? Then some culinary adventuring and a virtual trip to NYC? Sound good? I’ve never eaten a Cheese Doodle. I think they’re an East Coast thing. But I am no stranger to cheese flavoured corn snacks. In fact, I blame them for motivating my current exercise regimen. See, I discovered these baked ones at Shopper’s Drug Mart (Nativa brand). I got hooked, and soon found myself buying regular ones in lieu of the “healthy” ones when I couldn’t get to a Shopper’s. Anyway, I’m not going to get into some kind of taste test business, because that’s much too subjective. Instead I’ve prepared you a once-in-a-lifetime event. 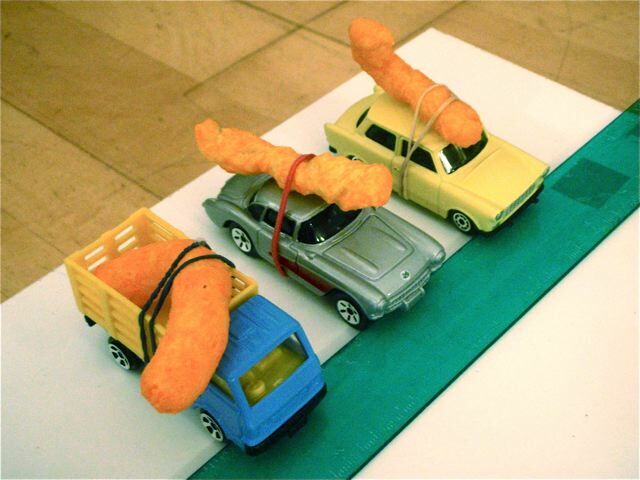 That’s right, a good old fashioned cheezy drag race. May the best snack win! May the best cheezie win! Today’s contestants (L-R) were Cheetos Puffs, Cheetos Crunchy and the all-Canadian preservative free Hawkins Cheezies. And the Crunchy takes it! Okay, so that wasn’t very empirical. I promise the next challenge will be less arbitrary. Well, there’s more to a cheezie than speed. I’ve also heard they make excellent firestarters. So which will burn the best? … but the Crunchy takes it again! And this was a significant victory. It burned much longer and more violently than the others. The “all-natural” Hawkins Cheezie didn’t burn well at all. Don’t put it in your survival kit. 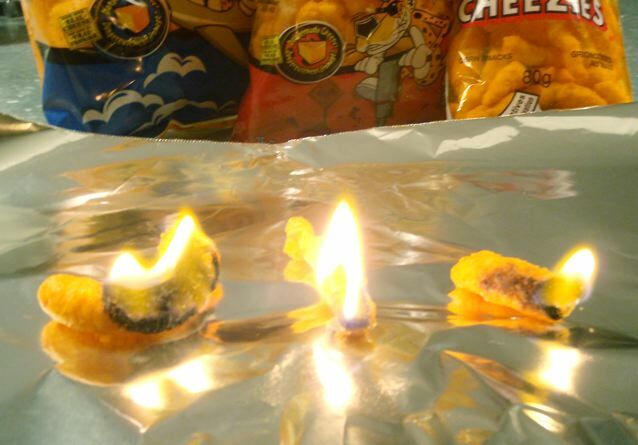 Well, what’s a cheezie blog without an attempt at homemade cheezies? My deep-frying skills were warmed up from taco chip day, so why not? Real cheese puffs get their puff from steam. The cornmeal/water blend is heated to a high temperature and kept under high-pressure. When it gets piped out into air the hot water content expands into steam, puffing the batter. That wasn’t an option for me, so I tried an alternative method. I blended 1/3 C each of regular corn flour (not Masa Harina) and corn meal. I added 1 Tbsp. of sharp cheddar cheese powder, 1/8 tsp baking soda and 1/4 tsp. salt, and blended well. To this I added about 3 Tbsp. of club soda and mixed it into a thick paste. I tried to pipe it but my piping bag wasn’t up to the challenge, so I shaped small sticks and dropped them into the oil. Once fried I tossed them with more cheese powder. They were good! I’d probably try white cheddar powder next time and maybe fry them a little longer. They were crisp on the outside and still slightly tender inside, but the smaller crumbs that I pulled out of the oil had a very similar texture to commercial crunchy cheezies. The main difference was the slightly grainy texture of my cornmeal – I suspect they use a finer grind, or cook and soften theirs more. 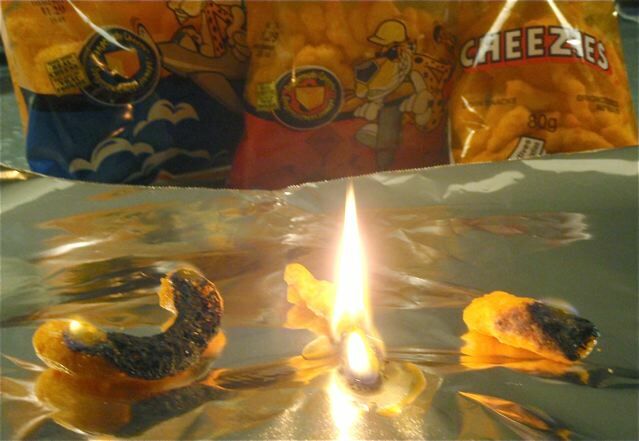 Finally I will leave you with the haute couture of Cheezie Cuisine. It’s true, alongside Lobster Salad and Porcini Ravioli with Gorgonzola Cream, some posh restaurant in NYC has created a popular side dish of broccoli with a creamy cheese sauce and cheezie topping. I will refer you to the recipe on the New York Magazine website. Well that’s it from Cheezie land for today! Happy snacking! That, my friend, was a piece of inspired brilliance. I quite enjoyed the “flame-off”! Oops! Should clarify that I used baking powder, not soda. Thanks for the comment, B 🙂 I had fun! Hilarious. Thanks. 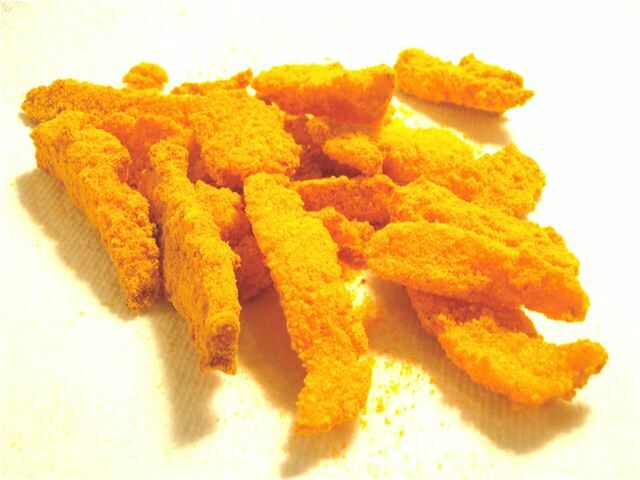 I think Hawkins Cheezies has to be one of my fave junk food. Janelle, we can’t help but love Hawkins Cheezies, Dad made us. 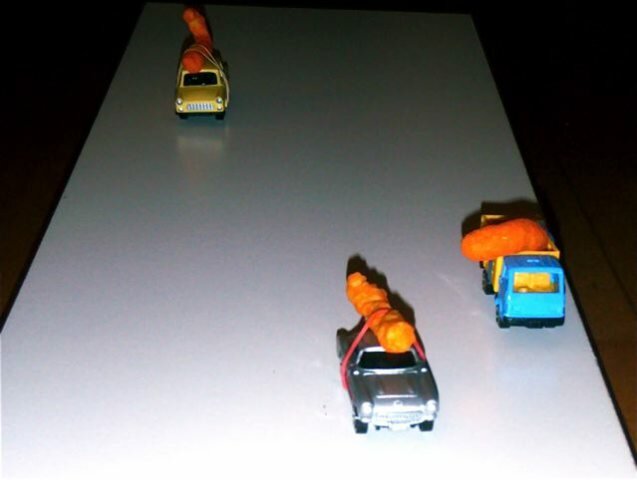 Sage, this was a fantastic post–I liked the racing cars best! This is fantastic. Who knew there was so much literature out there about Hawkins Cheezies? I’m sure if Shakespeare were alive he would dedicate a sonnet to them.